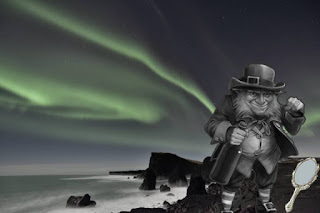 Archive: Inishowen Blog: INISHTRAHULL's FAIRIES / LEPRECHAUNS. Thanks to Inishtrahull Face Book page for publishing the following story. Check out their page here. For Centuries, Inishtrahull’s solidarity has been of great benefit to the Island’s resident Fairies. As darkness falls, Inishtrahull has always been said to become a very different Island where Inishowen’s wee folk can still hold their charm away from watchful eyes. But it was not always so, after years of turmoil and strange happenings, the original Islanders eventually accepted the customs and values of the Fairies and learned to live in harmony with them by respecting their ways and traditions, they knew all too well the Wrath of the Leprechaun. The long nights of winter mean more frolicking time for the fairies and it is then when their winter festivals become more visible from Inishowen with the majestic beauty of the Northern Lights dancing in the sky above Inishtrahull Island. They are very fond of Poitìn and Whiskey and they love to dance. The lack of large trees and other cover on the Island meant that the Island’s Leprechaun’s took sanctuary beneath the ground and so they constructed a vast network of underground passages and caves on the Island with various small entrance and exit points, many of which are still clearly visible today and were avoided at all costs by the Islanders. Inishtrahull’s original Lighthouse was fraught with bad luck and mishappenings due to the fact that an ancient Whitethorn Tree (The Fairy Tree) was destroyed on the site where the Lighthouse was built. The Whitethorn Tree is a sacred monument to the Fairies and this fact was understood by the Islanders and many people who lived on the Mainland. The Site of the original Lighthouse was selected by outsiders who gave little thought to the Islanders values and traditions, the Builders laughed off any intervention made by certain native Islanders in relation to “Wee People” or “Fairies”. The unsavory events that occurred (which I will not cover here) during and after the construction of the original Lighthouse were severe for those who selected the site, the outsiders who built it and the Islanders they employed to help them during construction. The Leprechauns wrath was so severe that it was eventually decided to completely demolish the original Lighthouse and relocate it to a neutral area on the Island that was not used by the Fairies, although the true reason for the relocation of the Lighthouse was kept secret from the public at the time, the Islanders made sure that it was not forgotten, they told the details far and wide back on the mainland and to all who docked at the Island. Of all the men and women who played a part in the construction of the Original Lighthouse, not one of them escaped the leprechaun's eventual revenge. The various pieces of construction material belonging to the original Lighthouse are still laying on the Island today, it was said that anyone who utilised them for their own benefit or removed them from the Island would be followed by bad luck and misfortune. The Island's wee people needed no boat to go from Inishtrahull to the mainland and back. They used special mirrors known as "Pictas", they had been gifted the Pictas by the High King Áed Findliath of Ireland in the year 872 A.D after the Leprechauns played a key role in releasing his mistress Niamh from the spell of an evil demon, after all, a leprechaun’s intentions are neither fully evil or fully good. The High King knew this fact all too well and so the Pictas were gifted to the Fairies on one condition, that they would never be used against him or his heirs as long as the throne remained on the Island of Ireland, this also meant that the Leprechauns could not use the Pictas to steal any of the royal treasure from the royal vaults, which was King Áed’s main concern at the time. The Leprechauns agreed to the King's terms and they were given 5 pictas in all, 1 of which was located on Inishtrahull and another on the mainland. The Pictas worked like a doorway from one to the other. In effect, it was said that the Pictas doorway could be opened, closed and locked by the Fairies. The Picta’s frame was made of Pure Gold and the mirror itself was made of an unknown material that resembled a normal mirror when it was in its static state. The Pictas were highly prized items among Seers of that time and also the very scarce Scientific community of that day. The Pictas were also highly sought after by Treasure Hunters who were aware of their existence. In the 16th Century, a Picta was unwittingly discovered in a small cave behind Bunagee Pier (still visible by boat today) by a fisherman from Carrowmenagh called Tadhg O Riann. Believing the Picta to be a valuable Gold mirror & being from a poor family, Tadhg made his way to Mr. O`Doherty the Blacksmith in Carndonagh that afternoon telling him the exact place where he had found it. He sold the mirror to the Blacksmith who gave Tadhg a relatively small price for it. That night, Tadhg visited Beatie’s Pub near Carrowmenagh where he used most of the money he received from the sale of the Picta to buy as much Whiskey as he could drink, he told everyone in the Pub the story of the Gold mirror he had found in the small cave and pawned in Carndonagh that day, Tadhg left the Pub that night to walk home but he was never seen again. Meanwhile in Carndonagh, you can only imagine The Blacksmith’s surprise when his newly acquired mirror started flashing and 3 small Leprechaun’s emerged from it after dark that evening! One eyewitness recalled hearing very loud screaming from coming from the upstairs of Mr. O`Doherty’s house similar to that of an old woman. Mr O`Doherty did not turn up for work the next morning or any day after that, his neighbours believed he had emigrated to America but could not understand why he would up and leave everything in the middle of the night, without telling a soul.. When Hugh Bana, an Inishtrahull man visiting Carrowmenagh shortly afterward heard the story about the Blacksmith and Tadhg, he allocated the disappearances of both men to the Leprachauns of Inishtrahull. The Carrowmenagh people banished Hugh from the Village for spreading such a story. Many Treasure hunters have searched the small caves in and around Bunagee Pier where Tadhg originally found the Picta, but to this day nothing of interest has been uncovered, the Leprechaun’s are still believed to use the Pictas as a means of transport to and from Inishtrahull but the location of the Picta on the mainland has never been determined, and the Picta on Inishtrahull is believed to be kept deep underground in the Fairy Caves. My great Grandmother told me this story many times and warned me at the end each time, that if I ever came across a Picta, to (a) not look into it and (b) most importantly leave it where it lies.